In September 2016, the Department welcomed Nicholas (“Nick”) Paquette as Pathology Laboratory Director for both Suburban Hospital and Sibley Memorial Hospital. Nick was hired to lead the Labs upon Debbie Aird’s retirement. 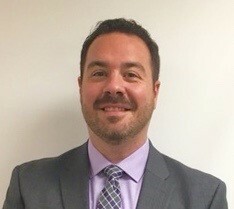 Nick is a graduate of Penn State University and holds a degree in medical technology with a minor in microbiology, and earned his Master’s degree in biotechnology from Johns Hopkins University. He is also a certified biological safety professional by the American Biological Safety Association. Nick began his career in the Microbiology Lab at Johns Hopkins Hospital where he worked in the Bacteriology Section when ID and susceptibility were still manually performed by agar dilution. Nick jokes that that’s where he perfected the ability to balance stacks of plates while walking to his bench. He also rotated through the Special Micro Lab where more specialized susceptibilities were run, and spent several years in the Molecular Micro Lab where he assisted in PCR assay development and the conversion of many tests from conventional PCR assay to real-time platform. At Suburban Hospital, Nick’s key goals are to better enhance workflow efficiency by utilizing appropriate technology through the LEAN process, and groom the next generation of laboratory scientists into strong leaders and managers. Sibley goals include lab space renovation to accommodate updated instruments to support the hematological oncology initiative, and to help staff develop a culture of accountability to enhance quality assurance and overall patient care. Nick said staffing is a major challenge and finding the time to take on some projects, but noted that SuccessFactors has been instrumental in helping organize goals and efforts not only for himself, but also for the employees. Staying active and travel have always been interests of Nick who completed two Tough Mudder races and a recent sprint triathlon in Key West, where his goal was to finish and not be the last one (he was able to do both!). Nick has not been to South America which is on his list of places to visit. He has a close group of friends, both local and out of town, with whom he often visits and travels with. Welcome back, Nick, and our best wishes to you!